While we love cold temperatures for snuggling and getting cozy by the fire, we don’t love the dry, itchy, and cracked skin that comes with frozen weather. During winter, cold temperatures means less humidity in the air. Dry winter air pulls moisture from the skin, and stuffy indoor heating further exacerbates the problem. If left untreated, dry skin can flake, crack, and even bleed. 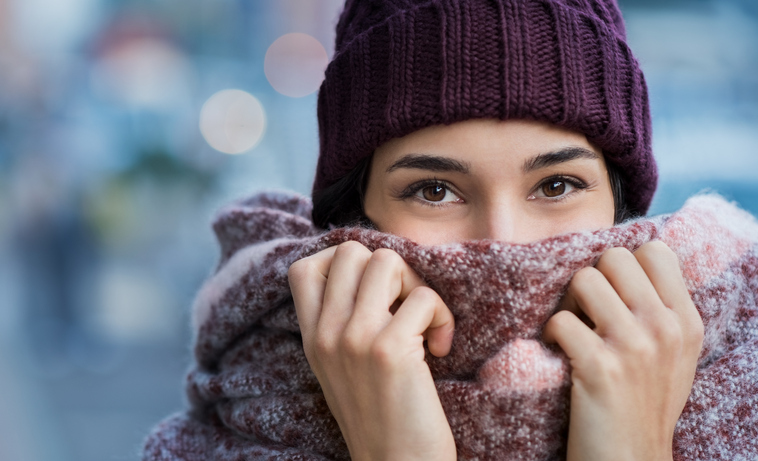 Fight parched skin this season by following these tips for treating dry winter skin. While a long, scalding hot shower feels amazing during subzero weather, hot water opens pores and dehydrates skin. To keep skin hydrated, shorten showers to 5-10 minutes and use warm water instead of hot. Pat skin dry with a soft towel, and apply a moisturizer like Herbacin Kamille Body Lotion while skin is still damp to lock in hydration. Keep skin healthy by gently exfoliating once per week. Exfoliation removes dead skin cells, preventing thickening and drying out of the skin. Invest in a gentle exfoliating scrub or a vitamin C serum, which dissolves dead skin. When temperatures plummet, it’s time to switch up your face moisturizer. Look for a rich moisturizer enriched with hydrating ingredients such as botanical oils and shea butter, like Herbacin Night Cream. Apply before bed for hydrated, healthy skin in the morning! Why buy an moisturizing mask when you can make one at home? In a small bowl, mix ½ ripe avocado with 1 teaspoon of plain yogurt and ½ teaspoon of honey. Apply in a thin, even layer all over face. Allow to sit for at least 10 minutes, and then wash off with warm water. Repeat once per week all winter long, or anytime skin is feeling a little parched! Cold temperatures and chilly winds can lead to chapped, flaky, and cracked lips. Always keep a moisturizing lip balm on hand, like Herbacin Kamille Lip Balm. Apply before going outdoors and whenever lips feel dry. Exfoliate chapped lips by gently rubbing them with a wet toothbrush and applying lip balm afterwards. Omega-3 fatty acids enable skin, nails, and hair to retain their natural moisture. Omega-3 fatty acids can be found in foods like salmon, olive oil, walnuts, flaxseed, and kidney beans. Not a fan of fish and nuts? Not to worry. Take a fish oil supplement instead for your daily dose of skin-hydrating fatty acids. Hydrate from the inside out by drinking plenty of water. Bored with regular water? Add herbs or fruits to water for natural flavor. As flu season spikes, we may find ourselves washing our hands more. While washing your hands is a healthy habit, repeated exposure to soap and hot water dries out skin. At home, keep a non-greasy hand lotion like Herbacin Kamille Hand Cream next to your sink so you can moisturize after every hand wash. Keeping a hand cream in your purse, on your desk, or in your car will ensure that you always have hydration on the go. How do you keep your skin moisturized during the winter? Let us know in the comments!